In a cheap French hotel room in Biarritz a man is writing the letter that will precede his death. He has recently met his son who wants him to return to his homeland of Pakistan and act like a proper old man for once in his life but son and father both know that it’s just not the old man’s style to ever really go back. They’re playing a game – concerned son, disobedient father – and they both know their roles. 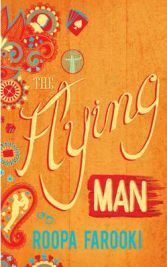 The Flying Man of the title is Maqil but he could more accurately be called the Fleeing Man because that’s what Maqil does. He makes his fortune, makes a mess and then makes a speedy exit. There’s always a lover, a cheated business partner, an unhappy victim of fraud, or detectives with uncomfortable questions about his friends and associates on Maqil’s tail. He’s a cheat, a gambler, a liar and a charmer who’ll sell his soul and his identity whenever the opportunity or need arises. As the book progresses we start to understand in more depth why the character of the opening pages is so sure that his death is coming. Maqil spends the rest of the book setting the scene, telling his story and listing the events of his life and all his roles and performances, establishing the network of lies and deceptions that made him who and what he is. He was born Maqil in Lahore, Pakistan, a twin whose brother was stillborn and perhaps that’s why he’s always been looking for a part of himself. Blessed with a good family and plenty of opportunity, he’s passed through life never quite overtly pretending but equally never confirming where he comes from or who he is. He has bounced around the world, recreating himself as Michael, Mike, MSK, Mehmet, Mikhail and even Miguel – he’s got the kind of complexion that means everyone thinks they know his origins but nobody’s entirely sure. His passage through life hasn’t always been lonely and he’s got three ex-wives to prove it though not all are technically ex or technically wives as he’s been a little lax on the issue of formally divorcing them. In many ways the wives tell us more about Maqil and his life than he tells us himself. The first wife Carine is a Franco-Egyptian beauty, elegant and educated, he finds here in the museum in Cairo in the department of Egyptian antiquities and leaves her as abruptly as he finds her, without a backward glance. His second is the great love of his life, his intellectual equal and the woman who understands him probably better than he understands himself. Feisty Samira comes to work in his Mumbai bookshop and wins his heart. He tricks her into having his children, boy and girl twins who destroy her sense of who she is yet fail to really capture their father’s attention. The third, Bernadette, is the wife for his older years, one he found in a hospital where she nursed him back to health before becoming the ‘proper’ wife his mother would have wanted for him despite her pale Irish skin and foreign ways. Carine is in and out of his life more quickly than you can say “Place your bets” but the other two are beautifully characterised and developed by Farooki with sympathy and understanding for their plight. Maqil is at various times a gambler, a fraudster, a forger and a charlatan of many different colours, yet despite his deplorable behaviour, readers will find themselves siding with him and egging him on to ever more outrageous exploits and adventures. He’s thoroughly unreliable and untrustworthy but his sense of charm oozes out of the pages. We know of course from the structure of the book that he must have kept ‘getting away with it’ and with the exception of a spell in prison which helped him to work on his golf handicap and do some useful ‘networking’, he largely does go unpunished by society if not always by himself. I am a big fan of Roopa Farooki and have read every one of her novels and adored most of them. The ‘dodgy bloke’ we find in The Flying Man is an extreme extrapolation of the often unreliable men she’s written about before and both men and women who are scared of commitment. There have been fathers who run two wives and two families, elderly shop keepers with elaborate romantic lives, women who run away when they fear love and various others whose shadows appear rolled up into the enigmantic Maqil. I was also – perhaps inappropriately – reminded of Hari Kunzru’s darker protagonist in ‘The Impressionist’, another who changes his identity along with his clothes. I enjoyed this book greatly, bouncing around the world with Maqil, following his exploits and watching him run from trouble but it’s not my favourite of Farooki’s novels – in fact I prefer most of the others with the possible exception of Half Life. She’s a master craftswoman at novels with complicated family groups, people whose lives are mixed up and entwined in ways that really make you sit back and think “Wow, that was really clever”. For me this wasn’t typically Farooki at all, despite the similarities I could see with characters from her earlier books. I enjoyed it but I didn’t LOVE it the way I loved Bitter Sweets, Corner Shop or The Way Things Look to Me. One of the things I love about many of her books is the way in which the characters’ origins are almost irrelevant to their stories – they have Asian or mixed heritage yet their stories are the stories of everyman and everywoman, regardless of where they came from. Maqil is almost the opposite – he’s too much the product of where he came from and where he’s been. I also missed the more London-centred plot lines of these novels, finding the multitudinous settings sped past a little too quickly. But despite it not being my favourite, it’s still a cracking good novel that I’m happy to recommend. With thanks to Headline Review for sending a review copy. No Comments on "The Flying Man"